The Surfacing Company takes the Health & Safety of operatives, contractors & the general public seriously. With this in mind we have our own robust in-house Health and Safety system in place to protect all that may come into Contact with The Surfacing Company Ltd when undertaking any works for our clients. Ensuring the Safety of Everyone starts at our Tendering stage where an estimator will visit site to assess your site needs whilst liaising with our clients our estimators assess any risk/hazards that maybe present on site. 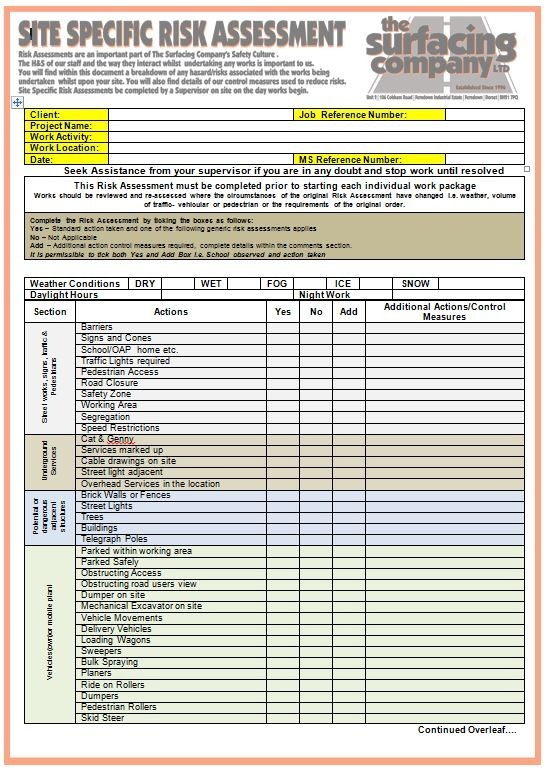 Any risks/hazards are captured on our Tender stage risk assessments and help ensure that nothing has been missed. 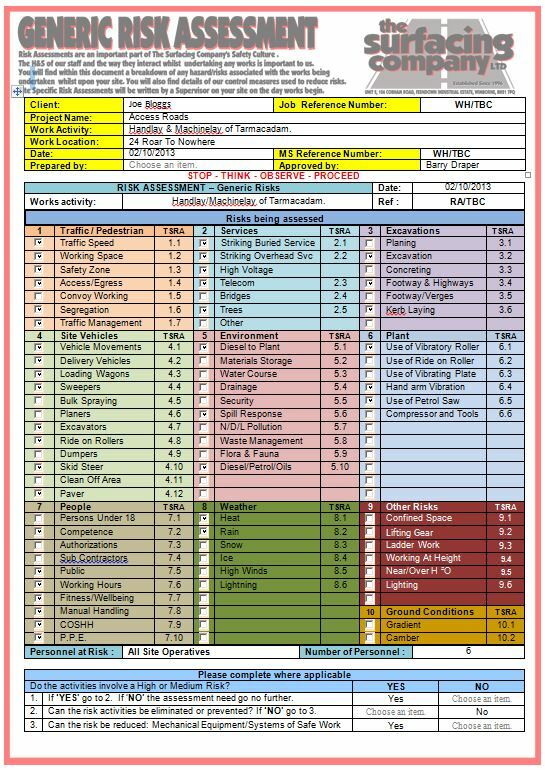 The data captured in these Tender Stage risk assessments is then fed back to our Health & Safety Manager who then utilizes that data to tailor Method Statements and Generic Risk assessments which are then sent to our clients. 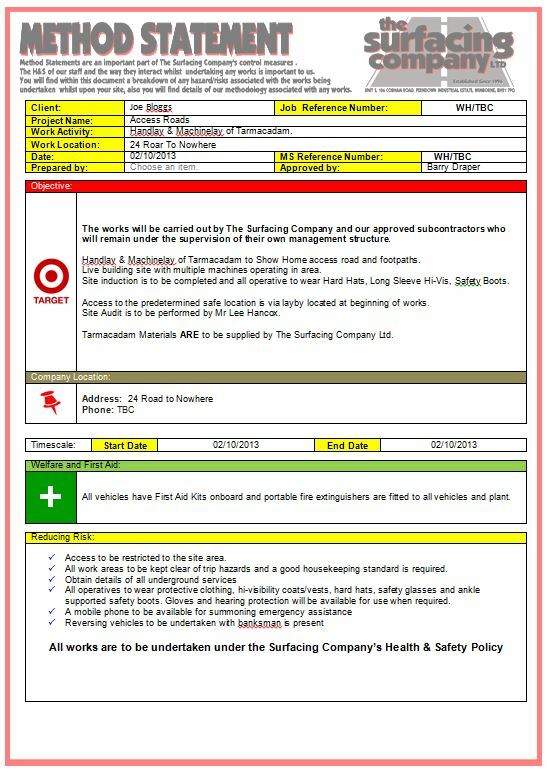 Our Generic Risk Assessments are further backed up with a comprehensive set of Task Specific Risk Assessments that have been devised from the wealth of industry specific experience gained by The Surfacing Company Ltd in it’s 17 years trading history. Our method Statements document the methodology of how works are to be undertaken, site contacts, site location, manpower requirements, plant & vehicle requirements, tool requirements and any COSHH/Environmental data that may be relevant to the site where works are to be undertaken. 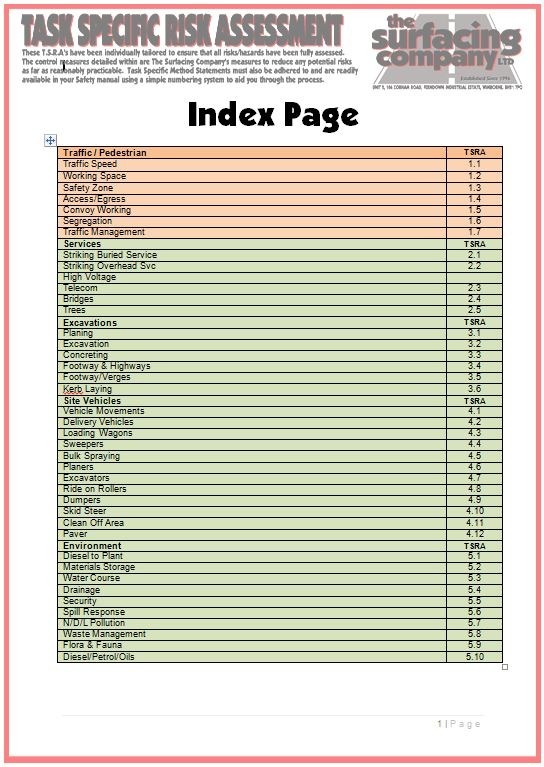 Our risk assessments using a scoring system out of 25-1 where 25 is High Risk and 1 is low risk. Our risk assessments then link into our task specific risk assessments that are tailored to The Surfacing Industry. 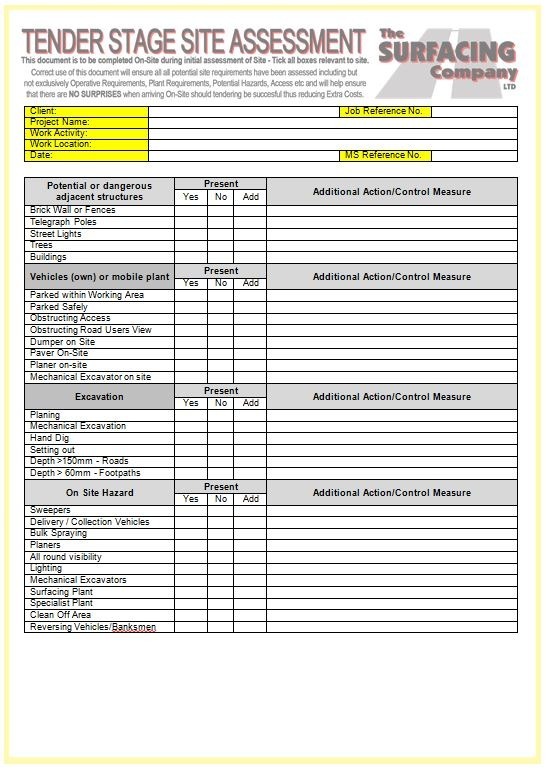 These Task Specific Risk assessments are a set of Golden Rules that must be adhered to and helps empower our operatives with the correct tools to make decisions on any necessary actions that need to be enforced to ensure health and safety remains paramount whilst undertaking any works for our clients. 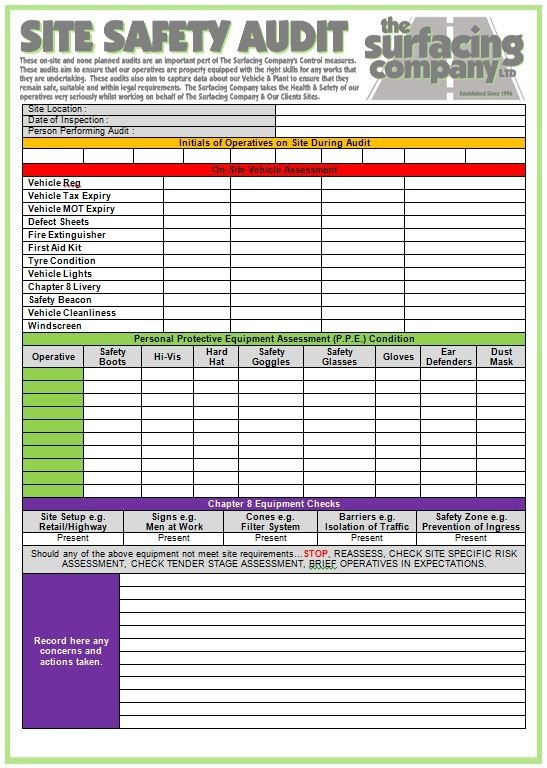 All our operatives should follow the guidance provided within these Task Specific Risk Assessments as they have been individually tailored to ensure compliance with the company health and safety policy. 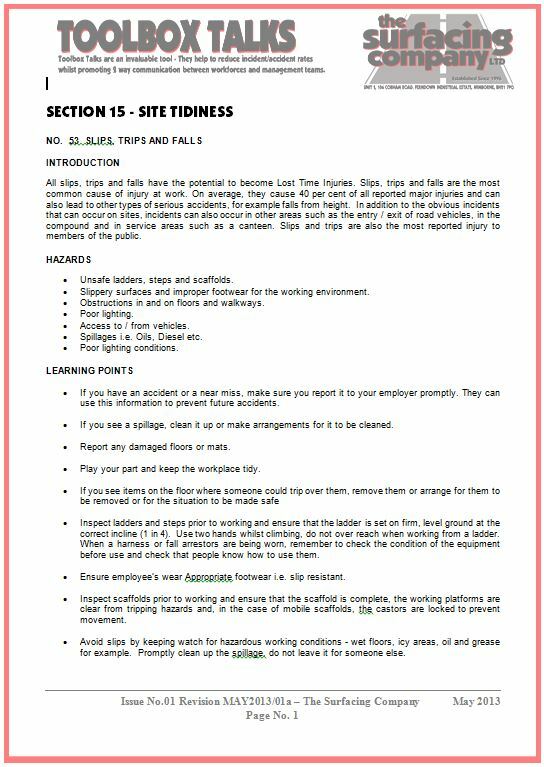 When operatives of The Surfacing Company Ltd arrive on our clients sites they must perform a Site Specific Risk Assessment to ensure that nothing has changed in or around the sites that works are to be undertaken. This stage of our Health and Safety system means that all operatives are included in the decision making process to ensure overall site safety. Operatives working to site requirements, operatives vehicle cleanliness, first aid kit presence, fire extinguisher presence and operative training. Finally all our operatives are regularly briefed about Health & Safety using a series of Toolbox Talks & Powerpoint Presentations. Please click the images below to expand examples to a larger image.